Bobcat 2.0 is the latest line of extremely programmable, high quality, low noise, CCD cameras with a high density FPGA for hundreds of programmable features. The latest generation of cameras from IMPERX include 8, 10, 12 or 14-bit output, four inputs and two outputs, dual clock design for a faster frame rate and GigE Vision, PoE, HD-SDI, Camera Link®, Power over Camera Link® (PoCL) or CoaXPress for the most demanding applications. The configuration capabilities are endless utilizing our easy camera configuration tool. This configuration tool allows easy programmability of each input and output. There are many ways to control the triggering including programmable pulses or intervals, frames to capture after a trigger, delays, debounce, rising edge or falling edge. Bobcat 2.0 also includes many different triggering modes such as asynchronous, standard, fast, frame accumulation and double trigger (for PIV). There are 14 different output modes to control other cameras, geo-rectify images, synchronize cameras, let the computer know if the camera is integrating or ready and more. The camera has internal image processing. The features set includes hot pixel correction, defective pixel correction, two look up tables (dynamic transfer function correction) with pre-built programmable corrections for gamma and knee-point corrections. Its powerful and sturdy interface is designed specifically for use with industrial cameras. It can do fast and secure handling of large amounts of data. The available bandwidths can accommodate very small cameras and also high resolution cameras at several hundred frames per second speed. Camera Link® is the standard interface that is best for data rates of 100 Mbps to about 800 Mbps. Camera Link® imaging cameras transfer images using the Camera Link serial communication protocol. A data transfer rate of 3.6 Gbps makes the Camera Link cameras ideal for high resolution demands or for high performance streaming applications. IMPERX cameras includes a wide spectrum of cameras from VGA to 2 megapixel and higher. Our small resolution cameras are optimized for the standard machine vision to the most demanding applications. Don’t let our cameras tiny design fool you, this powerful imaging tool is capable of integrating with any PLC, provides pre-processing to assist any software and has a dual clock design to gain more speed and efficiency. IMPERX cameras have 4 inputs and 2 outputs which are completely configurable for any application. IMPERX cameras have been designed to easily integrate into any factory line with features such as programmable delay of trigger, programmable amount of exposures per trigger, delay of trigger and/or strobe, alternating exposures and more. This type of programmability allows for easy integration even in the most challenging production lines. IMPERX cameras are manufactured with industrial grade components which provide confidence that the cameras will always be running. 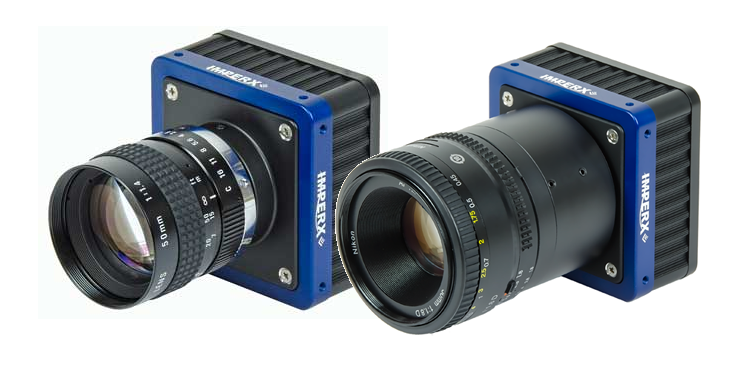 IMPERX cameras have an MTBF > 660,000 hours @ 40˚C. This certification provides the security that a production line will not stop due to the camera failing. Also, OEMs can be reassured that support will not be required due to the camera whether around the block or on the other side of the world. IMPERX has included an overclocked mode which will provide a speed improvement of 20%. Our cameras also include multiple Regions of Interest for the ability to increase the speed by removing the region or regions that do not need to be imaged. With multiple ROI’s, the camera is capable of increasing the overall data rate by not sending unwanted data. There are 7 programmable ROIs that can image an area as small as 2×2 to the entire imager. Lastly, with ‘Fast Triggering Mode,’ the camera can trigger at the full frame rate for perfect synchronization.